If you enjoy the craftsman style of architecture, doors and windows in this design can make your space look more inviting and appealing. Craftsman doors are a little wider than other styles of doors, and the windows can make a room look large and welcoming. Here are some design tips to keep in mind when you want to incorporate more craftsman style in your home. Dark varieties of wood look great with craftsman style doors and windows. Cherry and mahogany are ideal, or you can select oak and redwood to create the door as well. Part of what makes the doors so appealing is the fact that there are small windows at the top of the door that can be used instead of a peephole. When it comes to craftsman door windows, you can either leave the windows as they are or you can decorate them in a way that reflects your personal style. You can use a short curtain, blinds or etched glass designs to customize the craftsman door and turn it into one of the things that makes your home stand out. Craftsman windows have heavy paneling and can be constructed singularly, or in groups or two or three. The borders of the windows are often painted in white, but you can also choose variations of beige, brown or a metallic shade to make the windows more noticeable. Since the paneling is so pronounced and the windows look as though they are protruding from the walls, you may not want to add any additional curtains or window decorations. This is ideal if you have a minimalist sense of style. Craftsman doors are also easy to decorate because you can simply leave the door in its original wood hue or paint it in a bold color that will increase curb appeal. If you have a brick home that features red and brown hues, a cherry red door is a great way to make your home stand out, especially if you have gold accents on the exterior of your home like a mailbox or door knocker. If your home features shades of blue, beige or gray, a cobalt blue craftsman style door with silver paneling is a beautiful decorative choice. You can also decorate the entry of your home with tall pillars or vases that are filled with greenery to match the shape of the door. Hanging plants pair well with craftsman style doors as well, and you can also include a craftsman window next to the door to make the design of your home appear more uniform. Remember that the doorknobs you choose for a craftsman style door can also make this section of your home come alive. An elaborate doorknob that has a long vertical shape matches the shape of the door and makes the entryway look especially elegant. 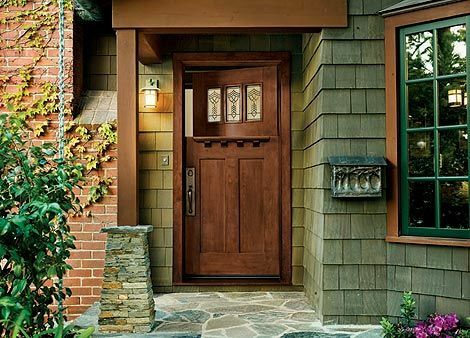 To choose the perfect craftsman door or windows for you, talk to a contractor who can guide you through the process of matching craftsman style with your home’s current architecture.